2015 Focus RS or ST? Some pics of a 2015 Focus ST or RS. I'm thinking it's an ST because of the grill. 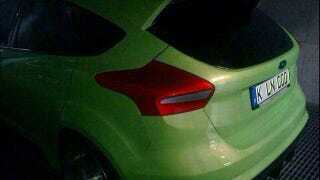 It is green, and the spoiler does look like an RS but it could easily be a redesign for the 2015 ST. Any thoughts? Edit: I think I see a rear diffuser. Can't see a rear diffuser on a ST. Anyone with photoshop skills wanna enhance those wheels? Is This Person Out of Touch, or a Different Breed of Car Guy?